The application back-end is built using Scala and Play!. For dependency management, running tests, compilation and staging we’re using SBT. Java is retained for some parts of the application (mainly BDD steps) since future users that might need to extend it might feel more comfortable with something more familiar. In other words, application itself (at least the server-side) is written in Scala. Parts of the application I thought others might extend is done in Java. All communication between the back-end and front-end (server and client) goes through REST API. Front-end is done with AngularJS and Bootstrap CSS for styles. Dependencies are managed with Bower and tasks execution with Gulp. For unit tests the weapons of choice are Specs2 and Jasmine. All functional specifications and testing are done using the BDD Assistant itself. For continuous delivery we’re using Travis that deploys the application to Heroku servers. May I ask how are tests are being run? 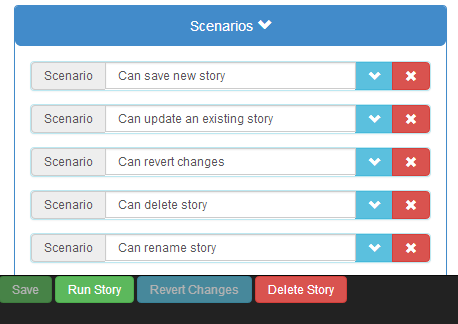 I think it should be key that both technical and non technical people can use the scenarios (eg. run them from Maven/Gradle should be possible). I gave up on the project some time ago. There was a lot of interest for such a product but I couldn’t find anyone to join me in development and had to abandon it. IMHO you marketed it wrong. I would not simply make it a “BDD Tool” but some sort of “THE Open Source BDD Test Management Tool” 🙂 Also TBH I find the naming not the best. I can’t see other reasons why not many ppl would use it? I abandoned the tool and concentrated on other open source projects (e.g. https://github.com/vfarcic/docker-flow-proxy and https://github.com/vfarcic/docker-flow-swarm-listener). I still think that the BDD tool has potential but my interests took me to a different direction. If you’re interested in working on it, I can give you admin permissions to the repository or you can fork it.